Pump or Electric Sprayers - Dilute 1 scoop (2 ounces) of Flex Powder with Citrus Solv per gallon of hot water for most heavy soils. 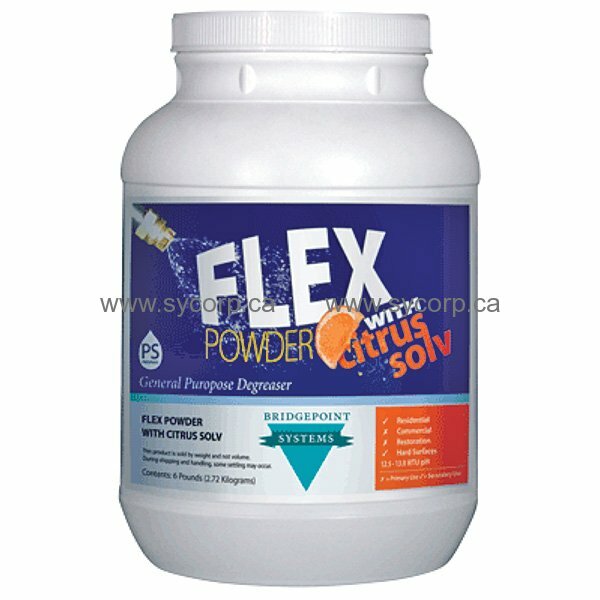 Use up to 2 scoops (4 ounces) of Flex Powder with Citrus Solv per gallon of hot water for extra heavy soiling conditions. Hydro-Force Injection Sprayer - Dilute 8 scoops (16 ounces) of Flex Powder with Citrus Solv per Hydro-Force container of warm water. Dilute at 1 to 8 setting. Application - Spray on traffic areas of carpet until evenly damp. Allow to dwell for 5-15 minutes. Do not allow to dry before extraction. Extract with normal cleaning process. Booster - Add 1 scoop (2 ounces) to ready-to-use gallon to create General Purpose Degreaser out of any typical cleaner.